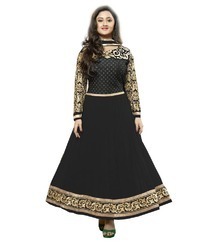 We have gained expertise in Manufacturing, Supplying, Exporting and Wholesaling best grade Georgette Designer Suit also in plus sizes.These are made using high grade fabrics and other embellishments. 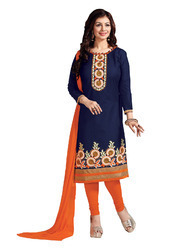 Along with this, we strictly adhere to latest market trends of the industry while manufacturing these designer suits. Offered range comprises Designer Suit, Designer Hot Suit, Bollywood Hot Designer Suit, Bollywood Designer Suit and New Designer Salwar Suit. 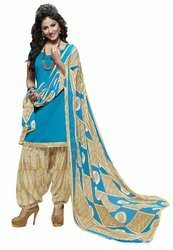 Blue plain suit with patiyala salwar and duppata. Embroidery Designer Suit is offered by us to clients in wide range. 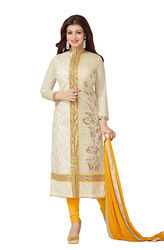 The offered Embroidery Designer Suit is available in different colors and designs. We manufactured this Embroidery Designer Suit as per the latest fashions and trends. We are the leading supplier of this Embroidery Designer Suit. 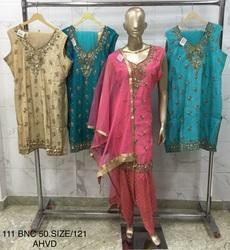 We also customized this Embroidery Designer Suit for clients as per their requirements. Designer suit embroidery work on neck side and bottom part, present in velvet fabric with red dupatta.